Although the post office as an institution existed in Durham for decades, the first dedicated building was constructed in 1906. The first post office was a grand building, suitable for the booming town that had recently gained wealth and recognition due to its lucrative tobacco and textile industries. 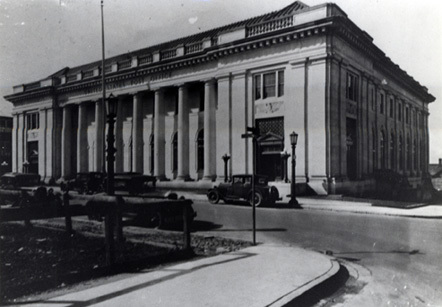 A new Neoclassical building on Chapel Hill Street, pictured here, replaced it in the early 1930s. At that point the old building was demolished and what is now the SunTrust Building was constructed in its place. The new $300,000 post office, built in the middle of the Great Depression, was paid for in its first 15 minutes of operation by taxes on local tobacco. The building continues to function as a post office today.